Well known as superpower country, Russia has the strongest military squad in the world after United States of America. Having the largest territory that almost covers Europe and Asia, they can manage the economical aspect of a whole country. Having enormous land territory, it is not a surprise to state that Russia is a country rich of natural resources. The geographical location extends from partly European country to the Asian has made significant role in the economic activity. From the data source, it is stated that Russia’s comprise around 30% of the world natural resources. That is the biggest reason that makes the country is able to stand strong with the economic crisis since the end of Soviet Era. The country relies much on the natural resources as one of their major exports to the growth of economy. In fact, they have abundance of mineral raw materials such as oil and natural gas, coal, iron ore, apatites, potassium salts, phosphorites, diamond, gold, silver, nickel, platinum, copper, and many more. The basic of Russian economy starts from the mining extraction, the processing into a material which is ready to exports and then finally the process of exporting to the destination country. Being one of the world leaders in oil production, with the total amount of 547,5 million tons in 2016, it is then followed by the natural gas production leaders at the same year of 2016 with total number of exports is 640.2 billion cubic meters. Along with the reserve of coal which can reach more than 200 billion tons. What a surprising reserve amount, it is equal to 5% of total world reserves. The location of coal mining extraction is at the Kuznetsk coal basin in southwestern Siberia. The site of where it can produce around 385.4 million tons of coal in a year, it is one of the largest coal mining areas in the world. While the uranium is processed in the Elkon mine, a large open pit mine of Uranium deposits located in the Sakha, Yakutiya Republic. Elkon represents one of the largest uranium reserves in Russia; also belong to one of the largest in the world. In a year, it can produce for about more than half of the explored uranium – around 344 thousand tons-. For the world production of diamonds and golds, Alrosa is the Russian company responsible for all process dealing with the exploration, production and also sale. As for the copper reserves, Russia contribute for about 3% of the world’s needs. The copper mining site is In the udokan mine, it is a large mine located in the Zabaykalsky Krai, south part of Russia and one of the biggest copper in the world. As the data above, we can barely state that major source of Russian exports come from the natural resources. Besides relying on the natural resources, Russian government recently pays much attention to the agriculture sector, since the sector has shown great significance to the economic activity. Having the fertile land extends from Siberia to the Urals regions. The government gives full support to the farmers, as they are ready to be the world largest exporter country in agricultural products by 2020. In 2016, Russia became the world leader in wheat exports. It is surprising facts that the agricultural products can be the Russia’s second largest export after oil and gas exports and surpass the army industry. 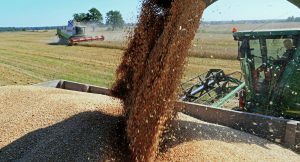 In fact, after wheat grains, the main crops of Russian agriculture are cereals (119 million tons in 2016, the world number 4th), sugar beet (48 million tons, number 1st in the world), sunflower (11 million tons, the world 2nd), soybean (3 million tons), potatoes (31 million tons, 3rd in the world), and vegetables (16 million tons). The region where is focus on producing grains is mainly in the southern parts until western Siberia. Besides crops production, the important aspect in agriculture is livestock products. The Russian region where is concentrate on the livestock is in the northern areas. The data number shown that livestock products produced in Russia are varying. They are meat (from beef – 1.6 million tons, then pork – 3.1 million tons, also poultry – 4.5 million tons). While the dairy products of the farming are consist of milk (30.8 million tons), eggs (42.6 billions), wool (56 thousand tons) and last is honey (68 thousand tons). The country is still improving for the best production regardless the weather condition and other factor which can affect their export supplies. Russia is one of the world leaders in power generation. The country electricity is produced at thermal, nuclear and hydroelectric power stations. Russia exports electricity in significant quantities, mainly to Finland, Lithuania, China and Mongolia. Besides, it can be said that Russia has its power to monopoly the exports of nuclear power plant. It is proved by the total number of its market has now reach 60% of the worldwide plants. The newest contract Russia has dealt with India, Turkey, Egypt and Hungary. A Rosatom foreign representative in Russian embassy is the party who is responsible for this important project. Well known with its army production, Russia is the world’s second largest conventional arms exporter –after the US. The country industry including designing and manufacturing then selling, the products are varying from small weapons, jets, nuclear submarines, armored carriers, infantry fighting vehicles, etc. the largest arm manufacturer in the country is Kalashnikov Concern.